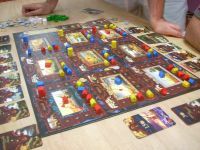 Today I played Spyrium for the first time and, I really liked it. Got me to think about games where a major component of the game is laid out in a 3x3 formation. Adding the ones I could think off. Add the ones you remember about! The inspiration for the list. A very neat Euro. Cool mechanics. 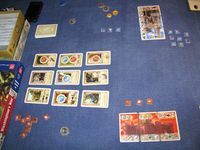 Theme is very superflous in it, as you are mainly just maximizing the conversion of some things into some other things into victory points (and variations thereof). This is the kind of game where the interaction is not straight, but anything other people do will affect you. Knowing whether to remain in play or start passing is at the core of the game strategy. Brain burny, but the right amount of it. 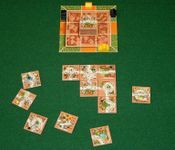 The village is composed of 9 tiles. One of the greatest coops ever. 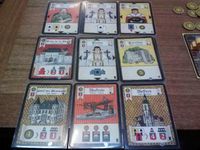 Each city is composed of a 3x3 grid, which you fill up with matching cards. 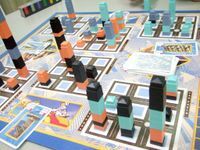 You score by having the tallest building on the board, the most controlled buildings on a city, and each building you control. One of my favorite light games. You are trying to connect two sets of two points in a 3x3 grid. Good puzzle solving and speed required. 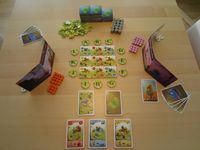 The cards you can buy are arranged in a set of 3x3, and your own tableau must be arranged that way. Really good "combo" type of game. Makes a very smart use of action selection. I thought about this as soon as I saw what Spyrium was about. The city blocks are placed in a 3x3 grid. 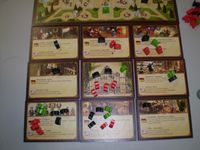 I did not ended up caring much for this version of the game as I found it did suffer a bit from setup issues (it is possible to lose early as Jack due to a bad combo of tile setup and tokens). 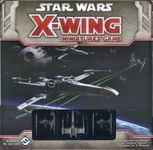 The greatest game ever, and attack wing are both played on a 3 ft by 3 ft playing surface! 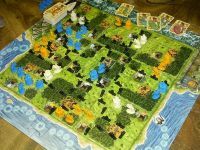 This game has an action selection mechanism governed by a 3x3 grid. Of the 3x3 cards, each player gets a row, column, diagonal (where the 2nd choice must overlap on one card). 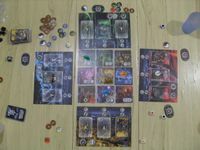 Each player gets 2 of 3 cards resources/powers, but the 3rd card, the overlap chosen by both players, is auctioned. Starts with a 3x3, and builds up and out from there. 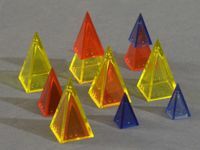 A clever game which needs only one stash of Looney Pyramids. 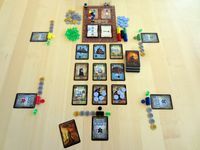 A clever placement game on a 3x3 grid, placing cards which cause various special effects. A cute little combo of rock paper scissors, tic tac toe, and balancing cards that get YOU points that can also give the opponent points, another little ditty I am happy to have in my games for non gamers pile !